Understanding the cost of solar energy is the first step in achieving affordable solar. 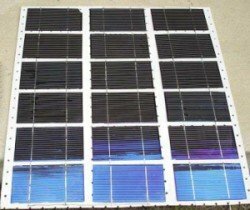 Residential solar systems are expensive. The process of estimating your costs will help you arrive at a system that meets your needs at a cost you can afford. Understanding all of the costs involved in setting up your system is crucial for making informed and well thought out decisions about your solar investment. How large will the system be? Will I install the system myself? A quick way to figure out how much power you need is to look at how much electricity you've used over the past year. You can do this by going over your monthly electricity bill. Your bill will show your monthly electricity usage measured in Kilowatt-Hours (kWh). To get your monthly average electricity usage, add up the monthly values and divide by 12. The resulting number is your average monthly power requirement. This needs to be converted to your daily energy requirements. To do that, multiply your monthly usage by 1000 to convert from kWh to Watt-Hours (Wh). Then divide that number by 30 to go from a monthly value to a daily value. The minimum system size you need is based on your average daily power requirements and the amount of available solar energy for homes in your area. Your available sunlight is known as solar potential and is measured in peak sun-hours for your region. To calculate the minimum system size, divide your daily power requirements by the peak sun-hours for your region. Assuming a 70% efficiency for your system, the resulting value is then divided by .7 to give you the minimum system size in Watts (W). According to the U.S. Department of Energy (DOE), the national average installed cost for a solar electric system is $9 per Watt. 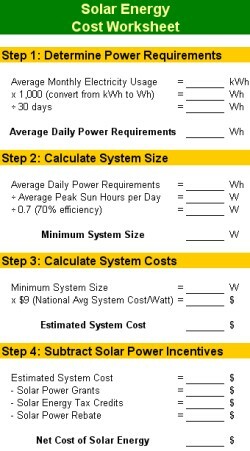 Multiply the result of Step 2 by $9 to estimate how much your solar power system will cost for equipment and installation. 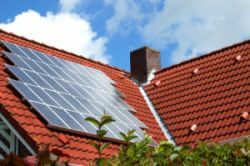 The final step is to subtract any solar power incentive you qualify for from the result of Step 3. The result of this step is the estimate of how much it will cost you to implement your system. 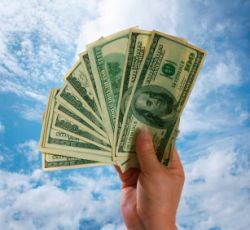 Understanding your cost of solar energy is just the starting point for determining if solar makes financial sense for you. To make a truly informed decision, you need to consider the economics of solar power. This includes your return on investment (ROI), payback period, potential for net-metering, and increase in your home's value. This forms the basis of comparison with the utility-provided electricity.